Following lunch at La Super Rica in Santa Barbara, The Astronomer and I high-tailed it up the coast to Solvang, where we met up with our friend Lang. We spent the afternoon and early evening exploring the local sights, which meant gawking at windmills, sampling locally produced wines, and poking our noses into Danish bakeries. Even though the town was mostly a tourist trap, it had a certain charm that couldn’t be denied. 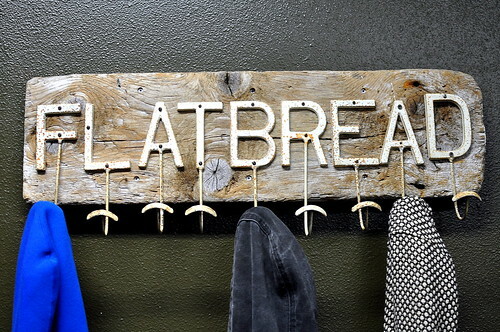 When dinnertime rolled around, we drove a little further north to Los Alamos for a feast at Full of Life Flatbread. The restaurant, which produces frozen pizzas Monday through Friday, is only open to the public on Friday, Saturday, and Sunday evenings for dinner. We arrived a little on the later side of service and avoided a lengthy wait, which I hear is the norm. 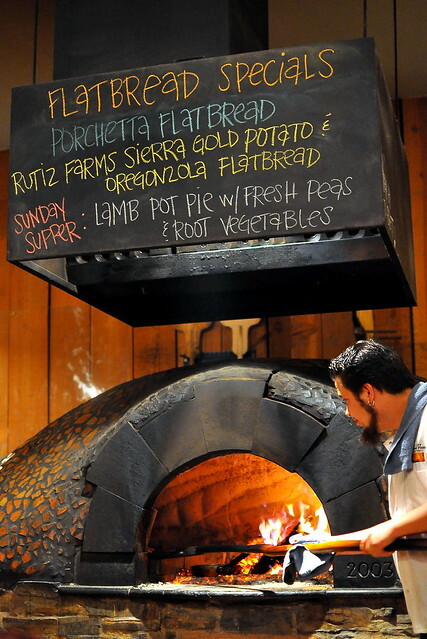 Full of Life Flatbread is committed to making everything it serves from scratch using seasonal and local ingredients. The restaurant’s owner, Clark Staub, and Chef de Cuisine, Brian Collins, draw inspiration for their weekend menu by visiting farmers markets and working closely with local farmers, ranchers, and fishermen. To kick off our meal, Lang chose a beet salad ($11) from the specials menu for our party of three to share. 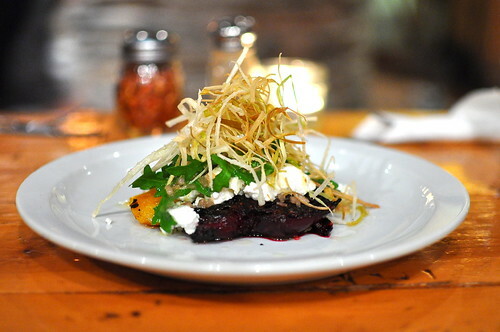 The “smashed” red and gold beets were served with Happy Acres Farm Goat Cheese, arugula, and crispy leeks. The salad was simple, light, and bright. For the flatbread portion of our meal, we ordered two pizzas with three different combinations of toppings. 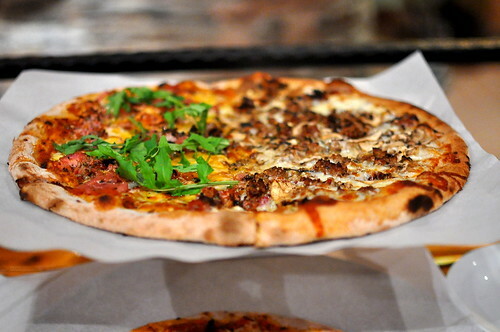 Our large-sized flatbread featured Porchetta on the left and Central Coast Sausage on the right ($23). Both pizzas were constructed using the same thin yet sturdy dough, which was blistered to a golden crisp in the wood-fired oven. The Porchetta Flatbread included whey-fed organic pork smoked with fennel, garlic, and rosemary, bacon, arugula, and pickled onions. The fresh greens and pickled onions balanced out the porky pie beautifully. The sausage pie next door was equally delicious. The star of each slice was the housemade maple and fennel sausage. Playing backup were sun-dried tomatoes, onions, mushrooms, cheese, and fresh herbs. Our regular-sized pie came topped with pepperoni, fire-roasted poblano chili peppers, onions, cheese, and tomato sauce. It was a spicy, savory, and meaty little number that made everyone at the table very happy. After polishing off every last slice of flatbread, our bellies were still game for more. 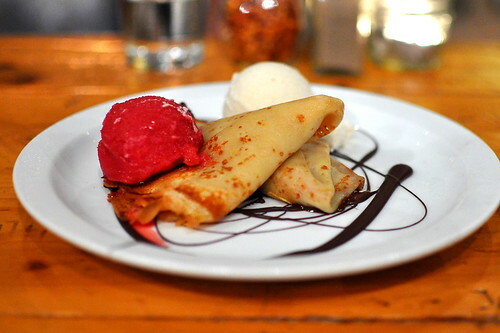 The first dessert that we ordered was the warm tangerine crepes with blood orange sorbet and vanilla ice cream ($8). The plate’s parade of tart and refreshing citrus fruits was just the thing to counterbalance the meaty morsels we just downed. Feeling a bit decadent, we also ordered an off-the-menu dessert known as “The Beast.” Dreamed up by a genius customer, The Beast marries a thick and chocolaty brownie slab with an equally monstrous housemade marshmallow. 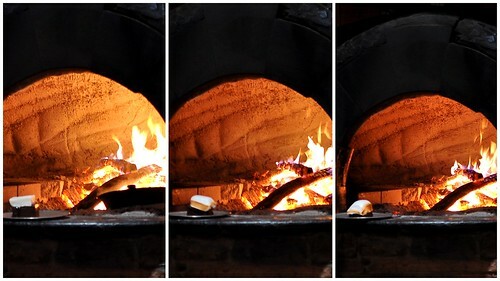 The two elements are stacked atop one another and placed on the edge of the wood-fired oven. 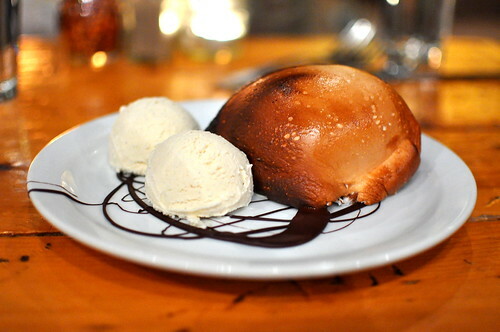 The fire’s residual heat gradually toasts the tower, creating a caramelized, sweet, and bubbly package. After witnessing half a dozen of these being constructed throughout the evening, it was a dream come true when our very own Beast ($10) arrived, along with two scoops Strauss Family Creamery vanilla bean ice cream. The warm and gooey brownie base was intensely rich, while the toasted marshmallow was smoky and sugary. It was an unbeatable combination. Between our three forks, we totally slayed The Beast. Full of Life Flatbread is good times. Simple as that! I must pass Las Alamos 4 or 5 times a year going up the Central Coast and I’ve never would have thought a gem could be found in that little town. I want to give “The Beast” a try now! I love beet salads! 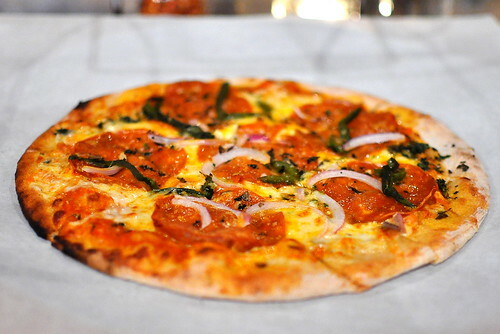 The pizzas look amazing and how can you go wrong with a dessert named “The Beast” — I’m a fan! not much a desserts person….but that Beast…..
Wow! “The Beast” looks beautiful. I’d love to dig into a plate of that right about now.